Mark Sargeant (of Folkestone’s Rocksalt and London’s Plum + Spilt Milk fame) has been brought in to revamp the menu at Trafalgar Square’s Strand Dining Rooms. The all-day restaurant, launched by restaurateur Mark Harris last year, received some pretty scathing reviews from the likes of Giles Coren “the chicken wasn’t fit to bait a mousetrap” and Matthew Norman “it scaled the apex of mediocrity”. On our early days visit indeed we found food with no oomph at all, but service that tries very hard and a grand-style brasserie in a handy location. Sargeant has been appointed chef director and will launch a new menu on 3 April, according to Bloomberg. The chef, perhaps most famous for his work at the now defunct Gordon Ramsay at Claridge’s, will focus the Strand Dining Room’s menu on British dishes such as lamb’s kidneys and roast beef. The very large (200-cover) restaurant was opened in July 2014 by Harris, who was a manager at the estimable Capital Hotel in the mid-’90s, and who – having then worked at Simon Parker Bowles’s Green’s Restaurant & Oyster Bar, and Searcy’s at The Gherkin – subsequently went on to found a restaurant consultancy under his own name. Wines are supplied by Bibendum Wines, Corney & Barrow, Flint Wines and Decorum Vintners, and Harris has stocked the bar with some of his own whisky. The interior, served up by the fashionable Russell Sage Studios, is based on a traditional Pullman Coach and include rich polished wood finishes. 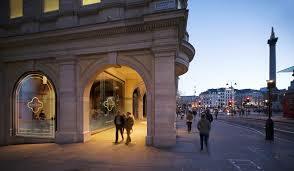 Strand Dining Rooms is part of the redevelopment of 1-3 Grand Buildings. Despite the august name and the seemingly period faÃ§ade, the building – on the corner of the Square nearest Charing Cross – is, in fact, entirely modern, having been completed in 1991. News Bibendum Wines, Capital Hotel, Claridge's, Corney & Barrow, Decorum Vinters, Flint Wines, Folkestone, Gordon Ramsay, Green's Restaurant & Oyster Bar, Innis & Gunn, London restaurant opening, London restaurants, Mark Harris, Mark Sargeant, Plum + Spilt Milk, Pullman Coach, Rocksalt, Russell Sage Studios, Searcy's, Simon Parker Bowles, The Gherkin, The Strand Dining Rooms, Trafalgar Square. permalink.